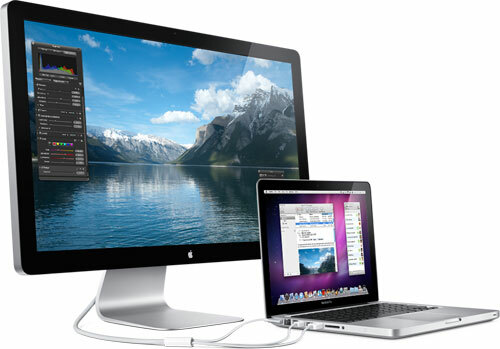 The 27" display also features a 16:9 aspect ratio, a MagSafe charger as well as a 3-port USB 2.0 hub. An ambient light sensor automatically adjusts the screen's brightness based on the lighting conditions. The new LED Cinema Display will be available in September for a price of $999. It requires a Mac with Mini DisplayPort connectivity. Apple has also dropped the price on its existing 24" LED Cinema Display to $799 from its previous $899 price point, although it appears that Apple may be phasing out that model as stock clears. Finally, Apple's aging 30" Cinema HD Display continues to be available priced at $1799, but that model is also available only while supplies last.